HCM City (VNA) - The Ho Chi Minh City’s People Committee will open six modern industrial-scale cattle slaughterhouse plants this year. From now to September 30, the city will open at varying times the six facilities, which will have a total capacity of 13,000 animals per day. 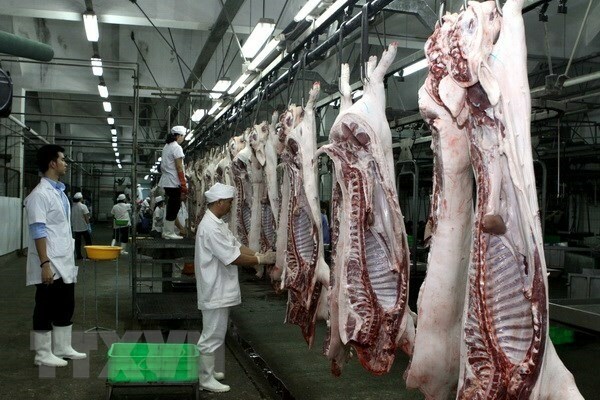 Hoc Mon district will have two slaughterhouses, including the Xuan Thoi Thuong and Tan Hiep FOOD PROCESSING PLANTS, with the capacity of 2,000 and 3,000 animals per day, respectively. Cu Chi district will have four facilities in Tan Thanh commune with the capacity of 2,000 animals per day, Tan Phu Trung commune with the capacity of 3,000 animals per day; one on Vo Van Bich street with the capacity of 2,000 animals per day and another in Phuoc Thanh commune with the capacity of 1,000 animals per day. In addition, the Vissan Joint Stock Company will open one slaughterhouse in their food processing industrial complex located in Ben Luc district in Long An province, with the capacity of 2,500 to 4,000 animals per day. When these slaughterhouses put into use, the city will shut down all traditional slaughterhouses where hygienic standards are often flaunted, except the Trung Tuyen slaughterhouse located in Can Gio district. The city now has 11 slaughterhouses with total capacity of 6,330 pigs and 82,000 poultry per day. Also, by the end of this year, the city expects to put into use two slaughterhouses belonging to Pham Ton Co. Ltd and Sai Gon Agriculture One Member Co. Ltd in Cu Chi district. The city expects that by 2020 the total capacity of these plants will reach 15,530 pigs, 300,000 poultry and 300 cows per day.